Who serves a hot vegan breakfast in London? This desire for a vegan fry up is something I can certainly relate to. What’s not to love about oily hash browns, beans and sausages? That said, I really don’t know many places that serve this dish in the capital. I ate the inSpiral Lounge vegan breakfast for the first time yesterday. The photo below shows their version of this British classic including tomato, hash brown, sausage, toast, scramble and baked beans. Why aren’t there more places doing this meal in London? If you know any other locations serving this highly-desired meal, please give details in the comments below. I think it is only right I personally sample every vegan fry up in the city! This entry was posted in I'll pay you to cook for me, London can you wait?, Potato equals truth, Vegan and tagged Camden, cooked, hot breakfast, InSpiral Lounge, London, vegan fry up. Bookmark the permalink. Briliant, I live around the corner from Inspiral, so I am so there for this!! Gallery Cafe in Bethnal Green do a great vegan English Breakfast – scrambled tofu, hash browns, vegan sausage, mushrooms, beans, sourdough toast and vegan margarine. When the sun’s shining, you get a table outside in the garden and they get it right i.e serve it when everything’s still hot, it’s phenomenal. Sadly they don’t always get that bit right. Other significant downside is their coffee. It’s awful. But round the corner is the super vegan G&T with some of the best coffee and vegan cake in East London. I think of this bit as the follow up to a Gallery Fry Up. Another consistently good option (but from a non veggie place is the Veggie Breakfast at The Premises on Hackney Road. Legendary recording studio cafe where you can veganise the breakfast and study the walls to see all the artists who’ve recorded there. Good soya coffee too. Only one tiny downside – no vegan margarine. Otherwise 10 /10. I still need to go there to try that! Yes, breakfast sandwiches would be such a good idea! Pogo Cafe do one. I went there yesterday for breakfast. The Convent Garden Hotel also do one that I’ve heard great things about. Oooh, the InSpiral beans on toast is amazing and less than £4! Bargain breakfast right there. 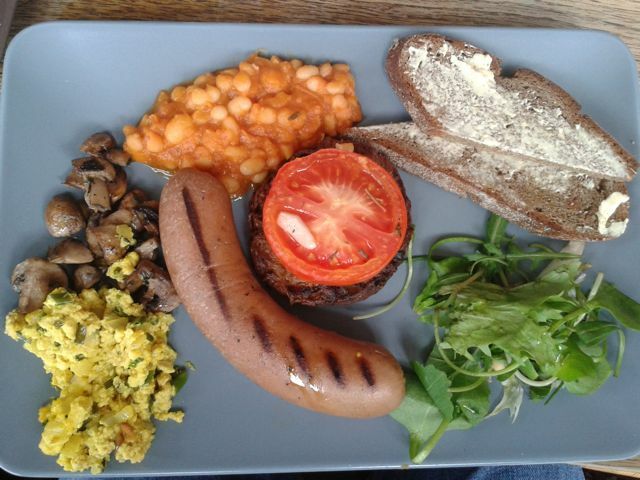 Bluebrick Cafe in East Dulwich does a vegan cooked breakfast – homemade vegan sausages! Yum! The Hornbeam Cafe in Walthamstow too. I am a coffee lover and it’s always nearly impossible finding a vegetarian place that combines hight quality food and coffee, so annoying.. Agree with Vanessa, G&T does do that for sure, and they do have a distinctive style. Never had anything from there that is not just great. Maybe because they don’t advertise the place as vegan that nobody else pointed it before on this blog? But totally to check out. why should vegans love a fake sausage?sad picture, isn’t it? I mean: I always wonder the meaning of this kind of vegan food. I’ve been vegan for 15 years and I never missed having sausages, not their taste, nor the appearance. Why on earth should I? I just don’t see the point, when there’s plenty of breakfast possibilities that don’t look like a nostalgic imitation of meat, and are real alternative and interesting ways to think about food and life style. It’s an interesting question, the mock-meat debate. I understand what you’re getting at — why should vegans desire foods which imitate meat? But I’d argue that a sausage doesn’t look like any part of a pig. Similarly, a burger looks like no dead cow I’ve ever seen, nor does a ‘nugget’ resemble any part of a chicken. The meat versions surely developed because the shapes are convenient? They certainly don’t resemble the source ingredient. So the vegan equivalents of these foods aren’t all necessarily imitating meat, but are rather using the same form-factor of popular conveniently-shaped foods. Well I suppose at the end of the day it’s not meat…. but then again, these food industry ‘added value’ (read: high profit) products generally contain very cheap ingredients highly processed. Then the food corporations use yer money in all sorts of ways you might disapprove of. You might actually be supporting some heinous animal oppressive practices that those who buy organic reared meat be avoiding. i.e. the carnivores could be doing more for animal welfare than you! The Covent Garden Hotel does a great hot vegan breakfast. However, it’s not cheap so one for a treat. I went to the Breakfast club as a veggie with some vegan friends. The veggie breakfast is amazing and my vegan friends bartered with them to trade the egg for avocado. It’s a bit pricey but very tasty.